Sadly, in every game, there are winners and there are losers. Many say that all Tim Tebow does is win. In this case he has lost. Tebow put on a remarkable show last season in which he truly defied logic. Anybody who saw the Broncos making the playoffs heading into last season is full of it. 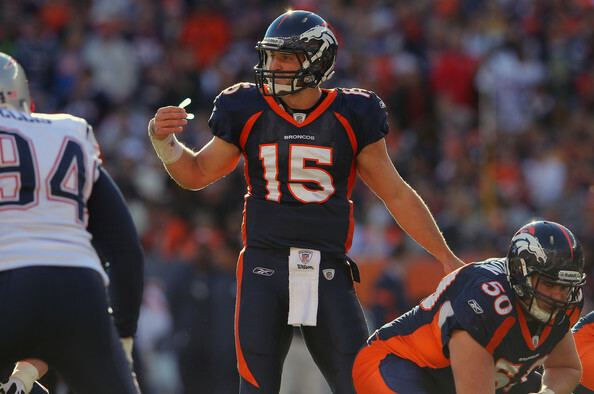 Tebow got the very most out of his abilities and willed his team to victory after victory. The saying goes hard work beats talent any day of the week. And I fully believe this statement. Unfortunately for Tebow, Peyton Manning not only has twice the talent, but he also has an equivalent or stronger work ethic. So the real question is what will be next for Tim Tebow? I was one of the many people who thought Tim Tebow’s date with the Pittsburgh Steelers on January 8th would be the last game he suited up as the starting quarterback for the Denver Broncos. I was wrong. It was the next to last game. Luckily for Tebow, he has options. Now I by no means am guaranteeing that he will be a starting quarterback next season. But the guy is a great football player who would be a positive influence in any locker room. He is the type of guy that any team in the League would want to have on the roster. 1. Jacksonville Jaguars: This is without question the most ideal landing spot for the former “Gator God.” Tebow will always be a legend in Florida, but he is also a high school legend in the Jacksonville area where he starred at Nease High School. In addition, Chad Henne and Blaine Gabbert don’t exactly strike me as franchise quarterbacks at this time. 2. San Francisco 49ers: Now you are probably mildly perplexed by this option. But it is not that far-fetched. There is still uncertainty regarding Alex Smith at this point. In addition, who would be a better man for the job of mentoring Tim Tebow than the NFL coaches version of David Blaine, Jim Harbaugh? It would be a project, but I do not think Jim Harbaugh has ever backed down from a challenge (at least as a coach). 3. New England Patriots: I would not be surprised if many of you are laughing out loud at this one. But hear me out. Though New England has not won a Super Bowl since 2004, they are still looked at as the “Yankees” of football. All Bill Belichick does is win. All Tom Brady does is win. All Tim Tebow does is win. Belichick has always been extremely creative. He could definitely find a spot in the locker room for this guy. For all of my Midwest folks, it is common knowledge that Indiana is considered “the” basketball state in the Midwest. And after Indiana, people typically consider Kentucky to be the next best thing. Well this year’s NCAA Tournament has provided a new perspective. Four of the final 16 teams are from the great state of Ohio. No state has every accomplished this feat. In addition, Ohio teams are a perfect 8 and 0 in the dance. Give a little love to the Buckeye State please. There has not been too much positive press regarding the Mets for some time now. Yesterday, there was a step in the right direction. The club’s financial future has been stabilized (at least for now). This is a definite victory off the field. Now wins on the field in 2012 may be another story. Derek Fisher is a winner and has been one of the most clutch playoff performers in the NBA for the past 15 years. Talks are beginning to surface about a possible Fisher to Miami scenario. We do know that he will not be playing for the Los Angeles Lakers or the Houston Rockets. It is well documented that Kobe Bryant and Derek Fisher are very close friends both on and off the court. And though Kobe does not admit to ever having a “real” rival, LeBron has always been considered the closest thing. Would Fisher really join forces with the “King” despite his friendship with Kobe? This entry was posted in Miscellaneous and tagged Bill Belichick, Blaine Gabbert, Chad Henne, Denver Broncos, Derek Fisher, Houston Rockets, Jacksonville Jaguars, Jim Harbaugh, Kobe Bryant, Lebron James, Los Angeles Lakers, Miami Heat, NCAA Tournament, New England Patriots, New York Mets, Peyton Manning, Pittsburgh Steelers, San Francisco 49ers, Super Bowl, Tim Tebow, Tom Brady. Bookmark the permalink.